I have been a klutz since birth. My chronic clumsiness has earned me such nicknames as “Crash” from a very early age. In fact, when I was about 10 years old, my mom found a children’s novel by Alida E. Young called “Megan the Klutz” which was later followed by sequels named “The Klutz is Back” and “The Klutz Strikes Again”. To this day, when I get injured or experience a near miss, she cackles in disbelief and recalls to anyone within an earshot about how some stranger wrote a series of books about me. Many of my injuries and near-misses result in my apartment. Recently, I hurt my toe. I think it’s probably broken but I don’t want to spend the money on x-rays for them to tell me to tape it to the adjacent toe and call it good. Anyhow, I incurred this injury by stumbling around in the dark after rearranging the furniture and stubbing my toe on the coffee table at high-velocity. Had I not recently purchased my nifty “intelligent surge protector”, I may have been able to see a little better due to the immense amount of light put out by my electronics even when they’re not on. You know what I’m referring to: the clock on the cable box, the clock on the DVD player that sits directly on top of the cable box, the LED indicators on the stereo and TV that show me it’s “off”, the glowing charge indicator on my laptop showing me it’s plugged in, etc. There were enough glowing, blinking gadgets in here to replicate a Christmas parade… before my intelligent surge protector (ISP), that is. Almost all electronics and appliances have these blinkers/glowers powered even when the device is turned off – which means they’re using electricity even in “off” mode. This energy consumption while ‘off’ is known as phantom power. As many people know, I hate wasting things – especially energy. So, short of unplugging everything in my apartment all the time, I needed to put an end to this phantom power crap. Intelligent surge protector to the rescue! 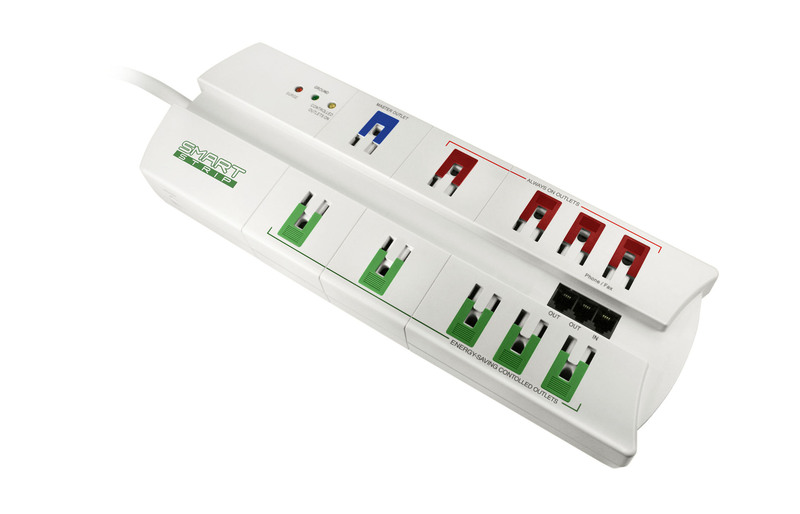 Most often referred to as “Smart Strips” (which is actually a model/brand name of a specific product), intelligent surge protectors use a sensor that can determine when your devices are turned off and automatically cuts the power to the device so all phantom power is also stopped. They typically have a couple normal surge protector spots that don’t include sensors for items like your cable box that you don’t want to reset over and over. In addition to those, they have ‘master’ and ‘slave’ outlets on them. The master outlet could be used for something like your TV while the slave outlets could house the DVD player and game console. When your TV is off, the ISP senses that it is only using phantom energy and cuts power to the TV and the items plugged into the slave outlets. The same goes for when you turn the ‘master’ device back on. These intelligent surge protectors are a must-have for those looking to cut costs on their energy bills. They can be used in a residential setting as I have implemented or in office buildings where laptops, desk phones, and other electronic devices are used regularly. They can range in cost from $20-$35 a piece but are estimated to save up to 73% of the phantom energy you currently waste your hard-earned cash on. Typically your energy cost savings can pay off the cost of the ISP in less than one year – which means it’s a no brainer, people! Just be careful when you’re walking around in the dark – it’s a darker dark without the glowy blinky things around. Love it! These are definitely going on my list. Thanks Megan. Any specific brands better than others? Funny that you asked that, Josh. At work, I’m limited to being an unbiased party regarding product and today I thought “Hey, I could have suggested a brand on my blog!” I would suggest the Smart Strip brand as it has been around the longest and they have the most options to best suit a person’s individual needs. Belkin has shown as decent thus far as well but Smart Strip kind of revolutionized the market for these things so I go with tenure. LCG3 has the auto-switch feature and 10 outlets. SCG3 has the auto-switch feature and 7 outlets. SCG4 has the auto-switch feature, 7 outlets, and fax/modem surge protection. SCG5 has the auto-switch feature, 7 outlets, and coaxial surge protection.